Talk about multiple personalities! Our latest discovery is part industrial butcher shop, part shabby chic restaurant and part vintage market. But it is 100% a carnivore's dream. In fact, this post comes with a caveat. I felt my cholesterol go up about twenty points just walking into Bottle and Bone. I can't even think what it must have been when I finished eating. You have been forewarned! Located in the entertainment district that has sprung up around the Birmingham Jefferson Civic Center, Bottle and Bone is one of many restaurants in the area, but it is still one of a kind. 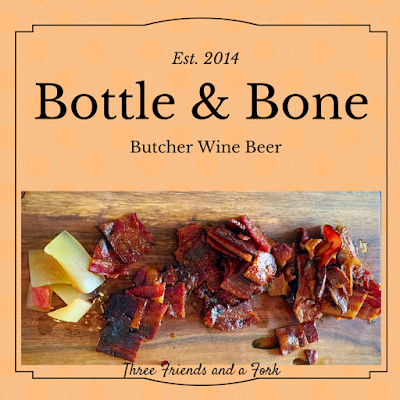 When I started researching Bottle and Bone, I was surprised to discover it was started by, Jen Barnett, the same bright mind who dreamed up Freshfully Market. If you remember, Sherri, Lu and I visited Freshfully Market a few years ago. We discovered it when we set out to find Saw's Soul Kitchen. We loved Freshfully and were sad when we learned it would close. Happily, the creativity of Freshfully has moved on to Bottle and Bone. Many of the made in Alabama products we loved at Freshfully Market have made the move to Bottle and Bone. Some of them even make it onto the menu. For instance, we found one of those products on the appetizer we ordered. 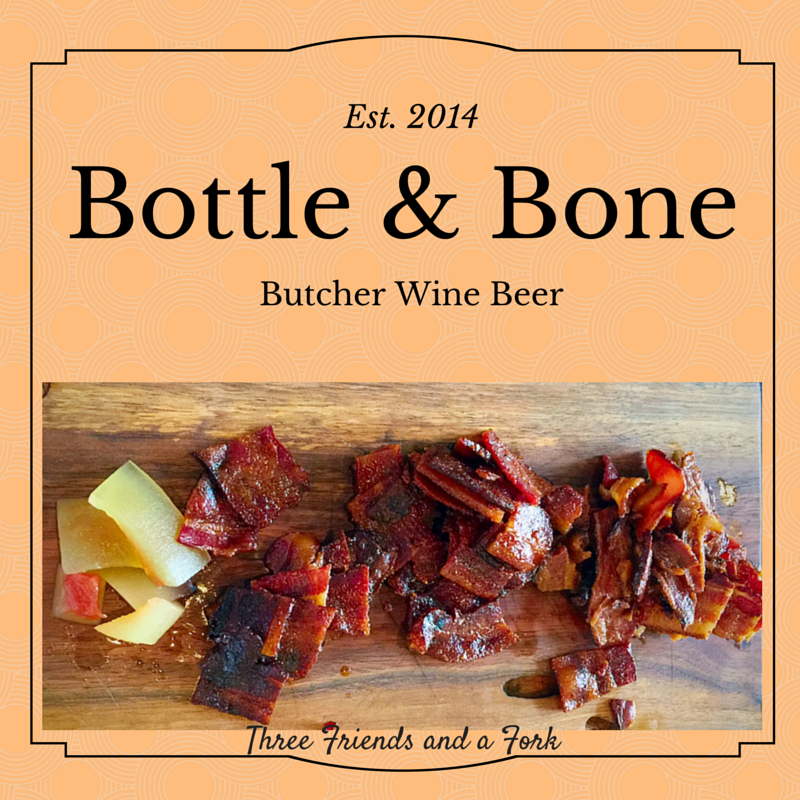 Our Bottle and Bone adventure began with a flight...a Bacon Flight. What is a bacon flight, you ask? It is, quite simply, a board piled with three kinds of Bottle and Bone's own bacon: the house regular, sweet chili and brown sugar. They are all amazing. Along with the bacon is a pile of Pickled Pink's watermelon pickles. Those sweet, vinegary watermelon pickles are the perfect accompaniment to the fatty bacon. Luckily, jars of those same pickles are available for purchase in the Bottle and Bone market. Guess who came home with a jar? Ordering our appetizer was easy, but it was a bit more challenging when it came to entrees. I had pretty much settled my mind on the Roasted Chicken Club with potato salad, when I heard Scott order the same thing. Now I was back to square one, because I really wanted for us to get different entrees. I was just about to choose the Braised Pork Torta, when our server helpfully offered to make a suggestion, which I was happy to take. His suggestion was the Daily Grind Burger, so Daily Grind Burger is what I ordered. When Scott decided to change his side of potato salad to the potato gratin, I chose potato salad to go with my burger. Here is Scott's roasted chicken club with potato gratin. He really liked it and it was delicious. The chicken was piled high on toasted bread and topped with lettuce, tomato, provolone cheese and Alabama white barbecue sauce. To my mind, the star of his plate, however, was the potato gratin. I think they were the best I have ever had. Sometimes potatoes gratin are overpowered with cheese, but these were buttery and tasted like cream. I was surprised how much I liked them. My fat burger was made with beef freshly ground by the talented butchers at Bottle and Bone. It was piled high with two thick patties topped with cheddar cheese, homemade pickles, red onion, lettuce, tomato and B&B sauce. I don't have any idea what B&B sauce is, but it was good and I didn't even need to ask for mustard and catsup. The only criticism I had was the winter tomato. It is just really hard to get wonderful tomatoes in Alabama in the middle of winter. Other than that, the burger was absolutely delicious! Our server did not steer me wrong. When I go back to Bottle and Bone, I will have a hard time trying something different, because I enjoyed that burger so much. The potato salad was also scrumptious. The potatoes were perfectly cooked and the dish was superbly seasoned. At any other restaurant I would definitely order it again, but Bottle and Bone has those gratin potatoes, you see. They will be hard to not to choose! The staff at Bottle and Bone was super helpful and consisted of two people the day we were there, Hugh and Daniel. They took our orders, made suggestions, brought our food and answered our questions. The decor of this small establishment is a mix of shabby chic, modern minimalist and industrial design. Along with the main dining room, there is a private dining area for parties and private events. The long table in the center of the room seats 12 and is anchored by a repurposed fireplace mantle at the end of the room. Signs around the restaurant encourage patrons to eat more bacon. I was also surprised when I looked up to see a the shape of a giant butchered pig hanging from the ceiling. It was made of pieces of rusty sheet metal pieced together to form the shape and covers pretty much the entire ceiling in the main dining room. This restaurant unapologetically flaunts its carnivorous personality. Finally, if you just didn't get enough of a meat fix during your meal, this authentic butcher shop is ready to help out. Just peruse the meat case and literally bring home the bacon. From steaks and ground beef to sausage and pork chops, the choice is up to you. If you like meat and you are not ashamed of it, a visit to Bottle and Bone has to be on your short list. It is a creative and innovative addition to Uptown Birmingham's food scene.